After the death of James Oliver in 1895, the Mathematical Club he had initiated stopped functioning and the Cornell graduate program who had produced six Ph.D.s and several Masters under James Oliver leadership appears to have become dormant for a few years. The department was led by Lucien Wait (Chair) and George W. Jones, excellent educators who certainly attempted to continue the legacy of James Oliver and implement his ambitious ideas but who did not supervise doctorates. The other members of the department were Assistant Professors J. McMahon and J.H. Tanner and Instructors J.I. Hutchinson, D.A. Murray and V. Snyder. Of these men, only the three young instructors had Ph.D.s. All except Murray, who left in 1901 for McGill, would remained at Cornell for the rest of their career. On October 10 1898, The Mathematical Club reappeared bearing the name The Oliver Mathematical Club. The first talk was delivered by J. H. Hutchinson who spoke on "Some Theorems Concerning the Hessian of a Cubic Surface". John Irwin Hutchinson was educated at Bates College, (A.B., 1889), Clark University (1890–92), and the University of Chicago where he defended his Ph.D. "On the Reduction of Hyperelliptic Functions (p=2) to Elliptic Functions by a Transformation of the Second Degree" in 1896. He shares with L. E. Dickson the distinction of having received the first Mathematics Ph.D. awarded by the University of Chicago. Hutchinson’s mentor was Oskar Bolza who he had followed from Clark to Chicago. He actually came to Cornell as an Instructor in 1894, two years before receiving his Ph.D., and remained for the rest of his career until his death in 1935. He is known for his work on the zeros of the Riemann zeta function. Through a gift of $6,000 made through her will in 1947, Mrs. Hutchinson established the Hutchinson Graduate Fellowship in Mathematics which is awarded annually by the Department of Mathematics. In 1897, George Abram Miller joined Cornell as Instructor of Mathematics. He only stayed at Cornell until 1901 when he moved to Stanford for a few years before joining the University of Illinois at Urbana-Champaign. There he stayed until his retirement in 1931. Miller had a boundless enthusiasm for mathematics. He received a Bachelor degree (1887) and a Master degree (1890) from Muhlenberg College and served has Principal in the Schools of Greeley, Kansas, for the year 1887-88. From 1888 to 1893, he was Professor of Mathematics at Eureka College in Illinois and started to offer advanced courses in Mathematics (one of his students there would replace him upon his departure in 1893). He received a Ph.D. in Mathematics, by correspondence, from Cumberland University in 1892. In 1893 he became instructor at the University of Michigan where he lived in F.N. Cole’s home. Later, Miller credited Cole for encouraging him to study group theory. In the years before coming to Cornell (1895-1897), Miller traveled to Europe where he attended lectures by Lie in Leipzig and by Jordan in Paris. By then, he had made a name for himself by completing the determination of the substitution groups of degree 8 and 9, completing and correcting previous work by Cayley, Cole and Jordan. Later, in work completed at Cornell, he published the list of the 994 intransitive groups of degree 10 and, for this work, he received a prize from the Academy of Sciences of Cracow. This prize had been standing since 1886 and may have been the first mathematical prize received by an American mathematician. To the mid and late twenty century mathematicians, Miller’s work may seem of limited scope and narrow interest. However, when comparing Miller’s professional attitude with that of other American mathematicians of his time, one finds there is something resolutely unique and modern in the way Miller’s lived his passion for mathematics. Indeed, during the four years Miller spent at Cornell, he directed the work of the first 3 Cornell graduate students of the post Oliver period. They all went on to pursue very successful careers in Mathematics. William Benjamin Fite received a Philosophy Bachelor in 1892 at Cornell and enrolled as a graduate student. He received his Ph.D. “On Metabelian Groups” prepared under G.A. Miller in 1901. Fite stayed at Cornell as Instructor and Assistant Professor until 1911 when he took a Professorship at Columbia University. He stayed at Columbia for the rest of his career and served as Treasurer of the American Mathematical Society between 1921 and 1929. His paper , “Concerning the zeros of solutions of certain differential equations.” Trans. Amer. Math. Soc., 19 (1917), pp. 341–352, is still cited today. Harry Waldo Kuhn received his Bachelor of Sciences at the Ohio State University in 1887. He enrolled at Cornell as a graduate student and received his Ph.D. in 1901 under G.A. Miller. His thesis, "On Imprimitive Substitution Groups" was published in the American Journal of Mathematics. He returned to the Ohio State University to become the first mathematics faculty of this institution holding a Ph.D. He served as Chair at Ohio State from 1926 to his retirement in 1943. Henry Lewis (Louis) Rietz was born in 1875 in Gilmore, Ohio. After receiving his Science Bachelor at the Ohio State University in 1889, he pursued graduate studies in Mathematics at Cornell. Working under the supervision of G.A. Miller, Rietz defended his Ph.D., On primitive groups of odd orders, in 1902. After a year spent at Butler College, Rietz took a position at the University of Illinois. In 1918, he moved to the University of Iowa as head of the department of Mathematics, a position he held until his retirement in 1948. At Illinois, Rietz developed an interest in Actuarial Science and Statistics at a time when neither subjects were well established in academia. He was a speaker at the 1924 International Congress of Mathematicians in Toronto becoming one of the first former Cornell graduate students to speak at an ICM. Today, Rietz is recognized as one of the influential figures in the emergence and growth of Statistical Science in the United States. Rietz served as president of Mathematical Association of America in 1924, vice-president of the American Statistical Association in 1925, vice-president of the American Mathematical Society in 1928-29. He was instrumental in the creation of the Institute of Mathematical Statistics and became its first President in 1935. He authored 150 scientific articles and supervised at least 14 Ph.D.s including Samuel Wilks. The math-genealogy project indicates that Rietz has at least 1154 mathematical descendants. The eighth American Mathematical Society Summer Meeting gathered in Ithaca August 19-24 1901, with Colloquium lectures by O. Bolza and E.W. Brown. Oskar Bolza, a student of Klein and the former advisor of Hutchinson, spoke on The simplest type of problems in the calculus of variations. Brown spoke on Modern methods of treating dynamical problems, and in particular the problem of three bodies. Soon after the turn of the century, V. Snyder began is exceptional career as the adviser of forty three Cornell mathematics Ph.D.s. Peter Field, who wrote a thesis "On the Forms of Unicursal Quintic Curves" in 1902, was Snyder's first Ph.D. student. A sample of the plates included in Field's memoir are shown above. Field spent most of his Career as Professor of Mathematics in the Mathematics Department of the Engineering College at the University of Michigan where he served as Chair. The name of Snyder's second Ph.D. student will be remembered for a very long time. Clarence Lemuel Elisha Moore received his Ph.D. "Classification of the Surfaces of Singularities of the Quadratic Spherical Complex", in 1904 and took a position at the Massachusetts Institute of Technology were he stayed until his retirement in 1931. The celebrated C.L.E. Moore instructorships at MIT are named after him, in recognition for the role he played in pushing the Department of Mathematics at MIT towards mathematical research and excellence. The 1904, the St Louis Mathematical Congress was held on the occasion of the World's Fair and Louisiana Purchase Exposition. The Olympic Games were also held in St Louis on this occasion. The American Mathematical Society played a key role in organizing the Mathematical Congress. Émile Picard, Gaston Darboux, Henri Poincaré and Ludwig Boltzmann delivered plenary lectures along with Maxime Bôcher, James P. Pierpont, Heinrich Maschke and Edward Kasner. In Section A, Algebra and Analysis (six lectures), G. A. Miller (then at Stanford) spoke on the “Bearing of several recent theorems on group theory” and J. I. Hutchinson spoke on “Uniformizing of algebraic functions”. Section B was on Geometry and consisted of seven lectures. Section C, Applied Mathematics, had three lectures and included Henry T. Eddy (then at Minnesota), “The electro-magnetic theory and the velocity of light” and James McMahon, “On the use of N-fold Riemann spaces in applied mathematics". The fourteenth Summer Meeting of the American Mathematical Society was held at Cornell, September 5-6 1907. Charles Sisam is one of two students of Snyder who graduated in 1906. After his Ph.D., Sisam studied at Göttingen and Turin and taught at the Naval Academy and the University of Illinois. In 1918, he replaced Florian Cajori, who was moving to Berkeley, as Chair of Mathematics at Colorado College. Sisam spoke at the International Congress of Mathematicians in Toronto in 1924 and Bologna in 1928, becoming one of the first Cornell Ph.D.s to speak at an ICM. He retired from Colorado College in 1948. Anna Lavinia Van Benschoten had received her science bachelor at Cornell in 1894 and was Professor at Wells College when she obtained her Ph.D. in 1908. She was the first of at least 14 women who obtained their Ph.D.s under V. Snyder's guidance at Cornell. The retirements of George Jones, in 1907, and Lucien Wait, in 1910, underline the natural shift from the early years of the department, dominated by the vision and outstanding personality of James Oliver, to a new period where the leadership would be provided by James McMahon, John Henry Tanner, John Irwin Hutchinson, Virgil Snyder and some younger faculty including Walter Carver, Francis Sharpe, Arthur Ranum, Wallie Hurwitz and David Gillespie. John Henry Tanner (shown at the blackboard) devoted his entire life to the Cornell Mathematics Department were he had obtained his Bachelor degree in 1891. Although he studied at Göttingen under Klein and Hilbert, his work was disrupted significantly by the aftermath of Ernst Ritter’s death and Tanner’s failed attempt to find another candidate for the vacant position at Cornell. After returning to Cornell, he received a Ph.D. from New Hampshire College in 1901. He served as Secretary of the Faculty in the College of Arts and Sciences between 1897 and 1903 and was very active in the American Mathematical Society, serving as treasurer for over ten years. He wrote successful text books and served as Chair in 1915-1917 and again in 1920-1923. In 1920, he and his wife established the Tanner foundation to promote mathematical research and instruction at Cornell with a very significant gift. Tanner's vision called for collecting interests on the principal for one hundred years so as to accumulate enough to support an Institute of Mathematics including named professorships celebrating the memory of Evan Evans, James Oliver, Lucien Wait and George Jones. Tanner retired in 1926 and died in Ithaca 1940. The Tanner foundation endowment dwindled during the great depression and the funds were later spent for the general support of the department. Undoubtedly, the dominant mathematical figure of the first thirty years of the twentieth century at Cornell was Virgil Snyder who, with Frank Morley at Johns Hopkins, was one of the American leaders in Algebraic Geometry. Although his mathematics had lost some of its relevance by the second half of the twentieth century, during his life time he was an influential figure in American Mathematics. He supervised at least 43 doctorates at Cornell. He was an invited speaker at the International Congresses of 1928 (Bologna), 1932 (Zurich) and 1936 (Oslo). In 1927-1928, he served as the nineteenth President of the AMS. He was a Fellow of the American Academy of Arts and Sciences. Snyder served as Chair of the department in 1913-1914. Walter Buckingham Carver received his Ph.D. at Johns Hopkins in 1904 with a dissertation titled "On the Cayley-Veronese Class of Configurations" supervised by Frank Morley. 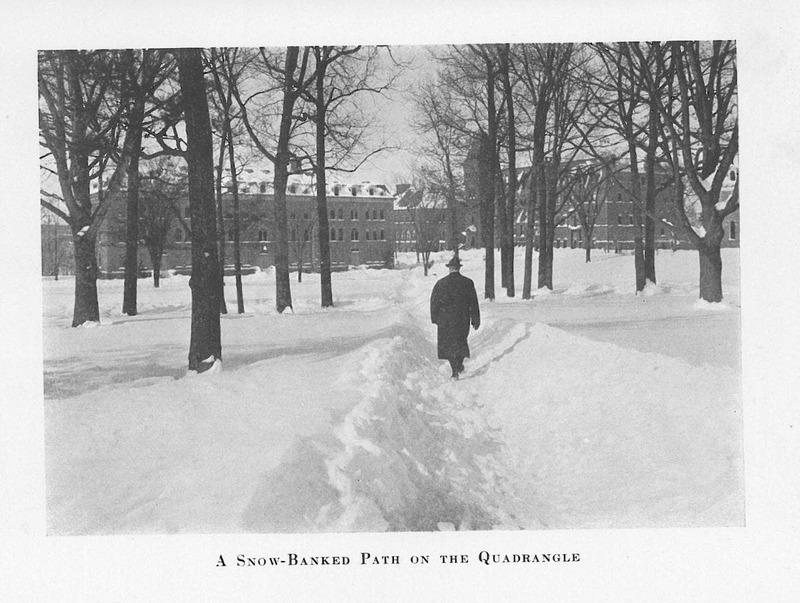 He came to Cornell in 1906 and stayed until his retirement in 1948. Throughout his career, his main interest was in teaching and undergraduate education. He served as Chair of the department between 1929 and 1932 and, again, between 1938 and 1940. He was very active as a contributor and as an editor of the American Monthly and served as President of the Mathematical Association of America in 1939-1940. Arthur Ranum (right) graduated from the University of Minnesota in 1892. After graduate work at Cornell 1893-96 and Chicago 1896-97, he became Professor of Mathematics and Astronomy at the University of Washington where he stayed until 1904. He spent the next two years at the University of Wisconsin as an instructor and at Stanford where he worked under G. Miller. In 1906, he was awarded his Ph.D. at the University of Chicago under L.E. Dickson and returned to Cornell where he spent the rest of his career until his death in 1934. He was known for his work in differential geometry. Francis Sharpe (left) was second Wrangler at Cambridge, UK, before lecturing at Queen's University, Ontario from 1901 to 1904. He then came to Cornell as a graduate student and earned his Ph.D. in 1907 for a dissertation titled "The General Circulation of the Atmosphere" supervised by J. McMahon. He stayed at Cornell for the rest of his career and became a close collaborator of V. Snyder while retaining a keen interest for mathematical physics. He served as Chair from 1923 to 1926. 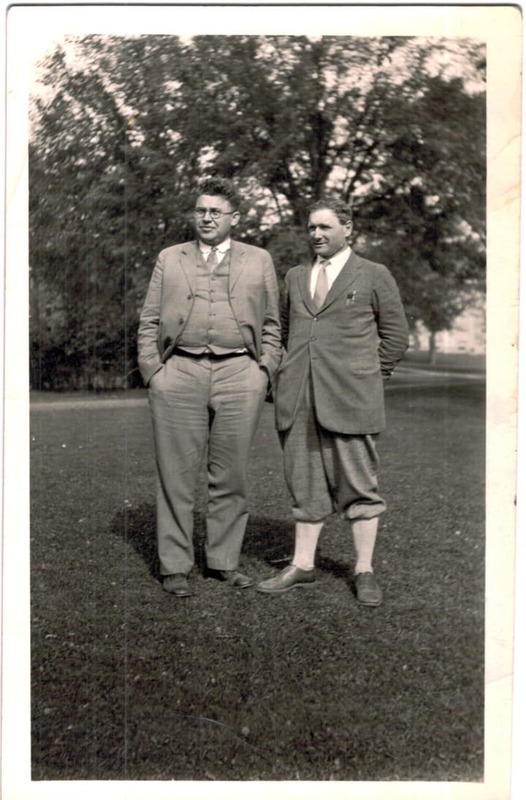 Clide Firman Craig and Frederick William Owens joined Cornell in 1907-08. Craig's Cornell Ph.D. was supervised by Hutchinson. He stayed as Assistant Professor until 1933. Owens was a student of E.H. Moore at Chicago. He left Cornell in 1926 to become Head at Pennsylvania State College. David Gillespie (far right) graduated in 1900 from University of Virginia and received his Ph.D. from Göttingen in 1906 under David Hilbert. He spent his entire career at Cornell where he collaborated with W. Hurwitz. He served as Chair 1932-35 and died, unexpectedly, in 1935. 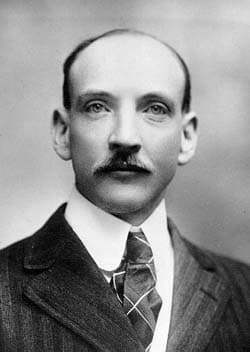 The Canadian mathematician R. Jeffery who later worked at Queen's University was his student. Wallie Hurwitz (right) graduated AM at the University of Missouri in 1906. He went to Harvard and won a Sheldon Traveling Fellowship, which enabled him to study at the University of Göttingen, where he earned a doctorate under Hilbert in 1910. In 1910 Hurwitz joined the mathematics faculty of Cornell University, where he remained until he retired in 1954. He served as Chair 1926-29 and 1935-38. He was the second most prolific graduate advisor of the pre-World-War-II period after V. Snyder and counts R. Agnew and R. Cameron among his students. His 42 years of service in the department bridge in a unique way the pre-World-War-I department to the very different post-World-War-II period. 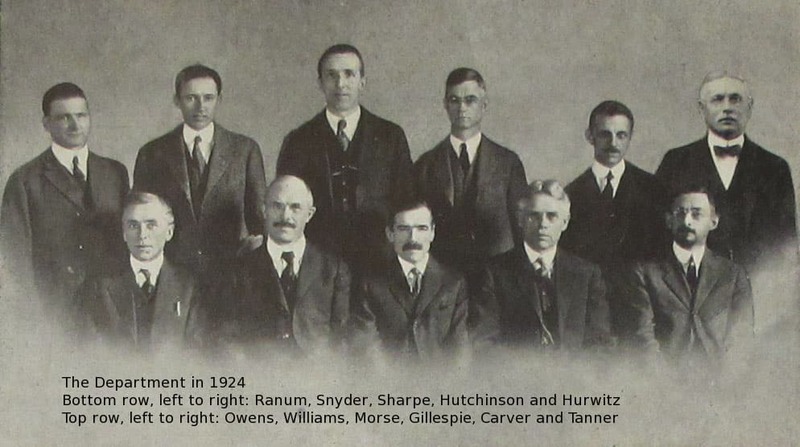 The Cornell faculty in 1916. From the Mathematics Department: (third row) F. Owens (38), A. Ranum (40), W. Carver (44), J. McMahon (46); (fourth row) W. Hurwitz (56), H. Tanner (57); (fifth row) D. Gillespie (75); (sixth row) J. Hutchinson (99); (second row from the top) V. Snyder (164). 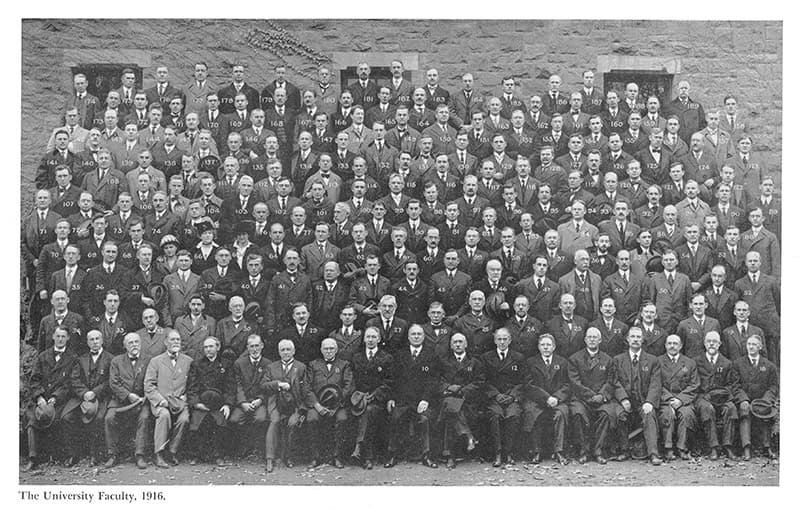 Thirty six Ph.D.s were awarded by the department between 1900 and 1925. Of these, seven were awarded to women and one to an African American. Remarkably, it is possible to reconstruct at least partially the career of everyone of these former students. Many served as Chair of their department including at Ohio State, Michigan, Dartmouth, Rutgers, Colorado College, University of Kentucky, Howard University and Syracuse University. One of them, Robert Wilbur Burgess, became Director of U.S. Census Bureau. Helen Brewster Owens is the first women to have held a faculty position (Instructor) at Cornell. Owens’ 1910 dissertation, "Conjugate line congruences of the third order defined by a family of quadrics", was supervised by V. Snyder. She served as Instructor in Mathematics at Cornell from 1917 to 1922. Later, she served as associate editor of the American Mathematical Monthly and taught at Pennsylvania State University between 1941 and 1949. She was very active in the battle for equal suffrage. Frederick Owens was her husband. Julia Dale’s dissertation, "Some Properties of the Exponential Mean", was supervised by W.A. Hurwitz. She taught at Mississippi State College for Women in Columbus, Mississippi, the University of Oklahoma, and Delta State College in Cleveland, Mississippi, before taking a position at Duke University in 1930. The Julia Dale Award is a cash prize awarded annually by the Department of Mathematics at Duke to a mathematics major on the basis of excellence in mathematics. 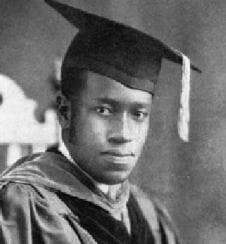 Elbert Frank Cox is known as perhaps the first black person in the world to receive a Ph.D. in mathematics. His dissertation, "Polynomial solutions of difference equations", was supervised by Lloyd Garrison Williams, a Canadian Mathematician who earned his Ph.D. at Chicago under L.E. Dickson in 1920 and taught at Cornell until moving to McGill in 1924, a year before Cox graduation. In September, 1925, Cox took a position at West Virginia State College. In 1929, he moved to Howard University where he served as Chair of the Department of Mathematics from 1957 to 1961. He retired in 1965. In 1924, the International Congress of Mathematicians was held for the first time in North America, in Toronto. Two former graduate students and three Cornell faculty spoke at that Congress. The former students were H.L. Rietz and C.A. Sisam. The faculty were J.I. Hutchinson and two who were leaving Cornell that summer, Harry Vandiver and Loyd G. Williams. Harry Vandiver was an autodidact, known for his work on Fermat Last Theorem who came to Cornell after serving during World War I. He left for the University of Texas at Austin in 1924. He later received the Cole prize and was elected to the National Academy of Sciences. Lloyd Garrison Williams studied at Oxford on a Rhodes scholarship before receiving his doctorate from the University of Chicago under L.E. Dickson in 1920. He joined Cornell on an instructorship and was promoted to Assistant Professor in 1922. He left for McGill in 1924. He is best known as the advisor of E.F. Cox and for his effort to established the Canadian Mathematical Society. One of the main prize awarded by the CMS, the Jeffery-Williams prize, his named after him and Cornell Ph.D. Ralph Jeffery. The early nineteen twentieth were marked by the presence of one of the greatest mathematicians who has ever worked at Cornell, Harold Calvin Marston Morse. The picture is from his Cornell's file. 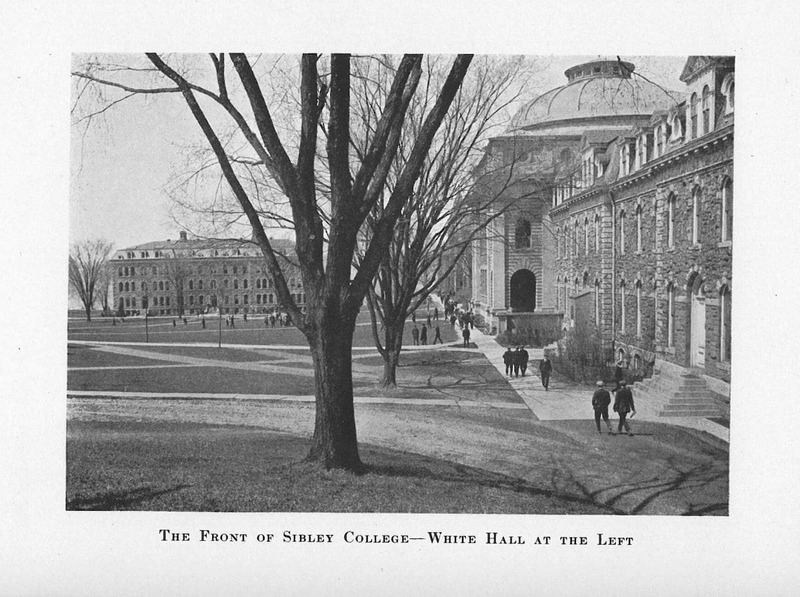 After Morse’s death, Stephen Smale wrote “I would place Morse with George D. Birkhoff, Norbert Wiener and Solomon Lefschetz among American (i.e., American trained) nonliving mathematicians as those whose work has had the biggest impact on mathematics.” The most important mathematical work done at Cornell between the opening of the university in 1868 and World War II is, without any doubt, the work of Marston Morse, "Relations between the critical points of a real function of n independent variables", published in the Transaction of the American mathematical Society in 1925. In this paper, Morse develops the first elements of what would later become known as Morse Theory. Morse graduated from Colby College in 1914 and obtained his Ph.D. at Harvard in 1917 under G.D. Birkhoff. His mathematical work was interrupted by World War I during which he served with distinction in the American Expeditionary Force. He was awarded the Croix de Guerre with Silver Star for bravery under fire. After the war, he was a Benjamin Peirce Instructor at Harvard before joining Cornell as an Instructor in 1920. He was promoted Assistant Professor in 1922 and moved to Brown in 1925 and Harvard the next year. He later moved to The Institute of Advanced Study. He served as President of the American Mathematical Society, was a fellow of the American Academy of Arts and Sciences, a member of the National Academy of Sciences and was awarded the National Medal of Science. At Cornell, Morse taught advanced courses such as Elliptic Functions and Integrals, Einstein Theory, Dynamical Systems, Analysis Situs and The Restricted Problem of Three bodies. During his stay, he published two other important works: "Recurrent geodesics on a surface of negative curvature" (1921) and "A fundamental class of geodesics on any closed surface of genus greater than one" (1924), both related to his Harvard Ph.D. thesis which he had defended in 1917. He supervised two Cornell graduate students, Bradford Fisher Kimball and Donald Everett Richmond. Richmond became Professor at Williams College. The Thirty-First Summer Meeting of The American Mathematical Society was held at Cornell University, Ithaca, N.Y., from Tuesday to Saturday, September 8-12, 1925. For such a gathering the location was ideal; the local arrangements left nothing to be desired; there was a record attendance, and enthusiasm ran high. The colloquium lectures, by Professors Eisenhart and Jackson, were delivered on Tuesday, Wednesday, and Friday afternoons, Thursday evening, and Saturday morning. The attending mathematicians and their friends were entertained at the Sage College dormitory of the University, and the meetings were held in the Baker Chemical Laboratory. On Tuesday evening President Farrand and the Mathematics Department welcomed the visitors at a reception in Sage College. Through the courtesy of the Automobile Club of Ithaca an excursion was made on Thursday afternoon to Enfield Glen, a very beautiful gorge near Ithaca. The Ithaca Country Club extended an invitation to visitors to make use of its facilities. Other enjoyable occasions were a luncheon at the home of Mrs. Owens for attending ladies, a reception at the Ithaca Country Club given by Mrs. Tanner, a visit to the Fuertes Observatory, and an organ recital by Professor Ballard of the department of Electrical Engineering. A hearty vote of thanks was passed to the various hosts and to the local members of the Committee on Arrangements, Professors Tanner, Gillespie, and Hurwitz. One hundred twenty-two members of the Society heard the Colloquium lectures. Pictured right, C.F. Craig and F. Owens, in front of White Hall.